Push notifications have made significant progress and become increasingly relevant to end users in the past few years thanks to more sophisticated segmentation via things like location-based targeting and dynamic messaging. But, while we know that consumers are used to and even appreciative of push notifications, there is still a large gap between reality and the ideal state of push. Case in point: the overall push opt-in rate in 2014 was 52%. Today, it has barely budged. One reason for this lack of progress is likely due to many brands still requesting push permissions too early in the process. We’ve said for a long time that it is essential that marketers build trust before asking for permission to activate push notifications. A brand must first convince an end user that interacting with its app will provide value to their life. This starts with creating a great impression on first launch. In the past, we found that the sweet spot to offer the opt-in is somewhere between four and six sessions. 6% of people still say that even one weekly push will cause them to abandon an app and 21% of users still abandon an app after one use. We as an industry have work to do to remedy this situation, but the good news is that even now we are seeing growth. Let’s start by reviewing these positive changes. Engagement is a key metric that marketers use to evaluate pretty much everything they do. When it comes to push notifications, engagement is measured as the average number of sessions push recipients completed within the first week of receiving the message. We are happy to report that engagement across all apps has seen a 30% lift since January 2017, is currently peaking at 3.75 sessions, and shows no signs of slowing down. It’s clear that marketers are learning more effective ways to engage their mobile users with push notifications in addition to segmenting audiences. The use of more advanced methods such as geo-push and dynamic content are definitely a big step in the right direction. In 2015, 65% percent of all push notifications were segmented. This reached 75% in 2016, and hit a high of 85% in 2017. Meanwhile, the percentage of broadcast push notifications being sent has come crashing down to a diminutive 15%. Gone are the days when marketers sent out ineffective blast campaigns to their entire user base. What’s so great about personalized messaging? 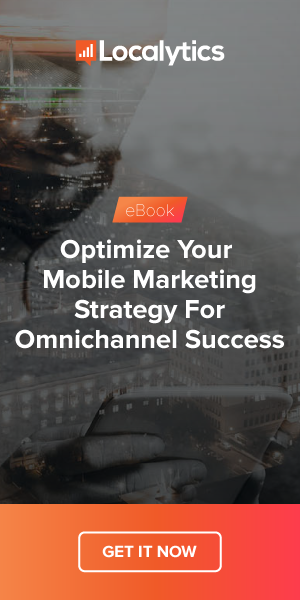 There are a few different campaign strategies that mobile marketers use. The most basic is the broadcast campaign, but the addition of user attributes, dynamic content, and location-based targeting offers a more layered approach. Let’s take a look at our three core performance metrics (engagement, open rate, and conversion rate) to evaluate just how effective these messages are. The simplest way to gauge satisfaction with your messaging is to calculate how many times users launch the app following receipt of a push. High engagement proves that users found value in your message and kept coming back for more. Engagement is noticeably higher for segmented campaigns that send dynamic messages. Even broadcast campaigns perform above the average if the content is dynamic. All types beat the average we see for all push engagement (meaning average engagement across all of the apps that Localytics works with), except for broadcast campaigns. Another simple way to determine a message’s weight is its open rate, or the number of times recipients clicked on a message within seven days following receipt, divided by the number of messages sent. A high open rate indicates that the message itself was interesting enough for users to explore further. We see similar results to engagement, with segmented campaigns that use dynamic messaging at the top of the pile and pure broadcast messages at the bottom. Although a great deal of actions completed can be considered “conversions,” ranging from “track favorited” to “video viewed” to “page viewed,” conversion as a metric still offers a means to understand how well marketers are reaching their goals. High conversion means that a message convinced someone to perform an action. These conversion rates are also calculated on a weekly basis and answer the question: seven days following receipt of a message, how many recipients converted? Once again, dynamic content sent to a targeted audience brings the best results, while broadcast campaigns that use dynamic content perform sub-optimally. This is surprising considering this combination performed well and even beat out pure broadcast campaigns on open and conversion rates. When marketers send out broadcast campaigns without dynamic content, their defined conversion events are usually more rudimentary, i.e., “Push Sent” or “App Opened.” Therefore, the marketer’s goal isn’t quite so lofty. With broadcast campaigns and dynamic content, marketers frequently define more complex conversion events because they are more thorough in general. Although the message is catered to the end-user, the goal is loftier, so conversion is more of a challenge. Marketers are still working to understand mobile conversion rates, so it’s essential that we view them through a critical lens. Boosting app conversion is a balance between defining your app’s conversion goals and building engagement strategies to reach those goals. If apps really want to create a unique experience, then tracking users’ physical location (with permission and secure data transfer of course) is a strategy that can pay off in spades. According to a recent Localytics survey, location tracking was voted as the most valuable type of trigger for push notifications after stated preferences. Since consumer perception is generally positive for this method, examining our own data can provide support for its use. Let’s return to our essential metrics to understand how enticing location-based messaging truly is. We found that location-based messages were opened nearly twice as much and converted nearly three times as frequently as regular pushes on a weekly basis. Although conversion rates remain difficult to define, they are actually more clear-cut when used in the context of location-based push. Circling back to the concept of marketers’ conversion goals, consider the fact that a geo-push is a real-time reaction to the end-user’s observed location. Any communication that reaches a user with little delay is going to incite a sense of urgency. Whether that means opening the notification or viewing a product, it will likely happen at a rate similar to how it was received, offering the user a reward for his or her quick reaction. Timing is everything. Achieving the ideal state of push can be a challenge. Marketers should feel encouraged by the work they have done and the rewards they currently reap, but the battle is not yet won. The rate at which users abandon apps is still too high. Changing mobile users’ brand perception requires constant care, and using data to inform marketing decisions can go a long way in creating a pleasant user experience. It’s a lot more engaging to be communicated with like a friend in a language only you share than to feel like a cog in a machine. Push is always striking a balance between satisfying users and nudging them to complete an action. Localytics is the leading mobile engagement platform across more than 790 million devices and 12,000 mobile and web apps. Localytics processes 115 billion data points monthly. For this study, Localytics looked at apps that have integrated push messaging across both iOS and Android. The opt-in rate was calculated using apps that have incorporated push messaging. Broadcast campaigns are defined as messages that are sent to all of an app’s users, while segmented campaigns are sent to users based on behavior and/or profiles. The timeframe for data in this study was January 1st 2017 to April 30th, 2018 except the 2018 opt-in rate, which was calculated using data from January through April 2018 and the 2017 percent of pushes by campaign type was calculated using data from January through December 2017. All results are based on worldwide app usage.